by Dave from The Longest Way Home ~ January 2nd, 2019. Published in: Travel blog » Iran » Photography. 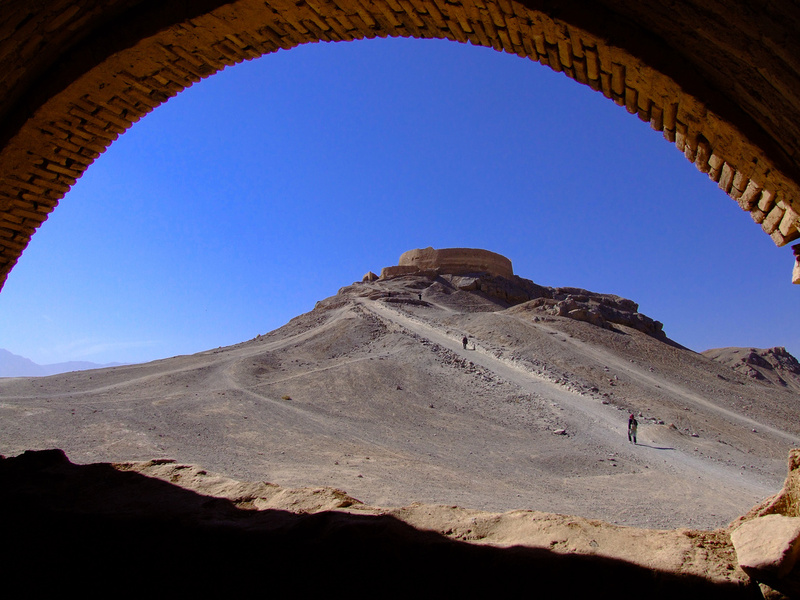 The Zoroastrian Dhakma or “Tower of Silence” was first noted back in the 9th century but the practice they were used for dates to the 5th century. It was used for excarnation (removal of flesh from a dead body) by vultures. The reason for excarnation to remove dead bodies was because both the earth and fire are sacred to the Zoroastrians. In the world of nature it’s a normal daily occurrence in the wild. Zoroastrianism is one of world’s oldest religions dating back to 2,000 BCE and is still practiced today. There’s a believe in one god along with good and evil. The origin of Zoroastrianism are usually linked to Persia and Indo-Persia where the practice is mainly documented then as it is today with about 200,000 still in practicing. The prophet Zoroaster is said to have appeared by 1,000 BCE but the religion as a whole was not that well documented until the 5th century BCE when the Magi people who predominately practiced the religion were curbed of their powers by Cyrus the Great and is son Cambyses II. Dhakma’s can largely be found throughout eastern Iran and in some parts of India. In the 1970s Iranian towers were largely abandoned for several reasons. Islam dictated that the mutilation of corpse was against its laws. This, ironically, meant the towers were often broken into by medical students seeking dead bodies to examine. Finally, expanding towns did not want the practice nearby. Zoroastrian’s soon began to bury bodies in rocks which did not touch the earth. Today using Dhakma’s is forbidden in Iran however it’s quite obvious many are still used unofficially. In India the practice of excarnation continues on despite a shortage of enough vultures due to poisoning from a drug used on livestock. Today the vulture population is increasing but some Zoroastrian’s within India prohibit mixed marriage Zoroastrian’s to the Dhakma’s. Every year during the holidays I publish 12 days of photographs from around the world. It offers a short break from the hustle, bustle and stress this time of the year can often bring. A collection of photographs from my journey that will hopefully distract, inspire and show you some unique and interesting places. I hope you enjoy!